You can't underestimate the importance of having a healthy, beautiful smile. When you're proud of your smile, you feel more confident. But if you're embarrassed about the appearance of your teeth, you may find it difficult to be at your best. Dr. Charles J. Pybus can help to restore your confidence and give you the smile you have always wanted with porcelain veneers treatment at our Amarillo cosmetic dental office. Porcelain veneers are covers that are permanently affixed to the fronts of the teeth, changing their shape and appearance. Veneers are custom-designed to look as natural as possible. Dr. Pybus matches the color of the veneers to the color of your natural teeth so that no one will be able to tell that you have had cosmetic dental work done. Getting porcelain veneers is a minimally invasive procedure with little to no downtime, making it a convenient option for those who could benefit from several cosmetic enhancements in one treatment. The cost of veneers depends upon how many are needed and the severity of the problem that makes cosmetic treatment necessary. Our financial coordinator will fully discuss the costs with you and explain all of our available payment options to help you afford treatment. Dr. Pybus has more than 30 years of experience as an Amarillo cosmetic dentist, giving him the knowledge needed to develop the best treatment plan for every patient. At our office, we use state-of-the-art digital x-rays to plan treatment to ensure optimal results. 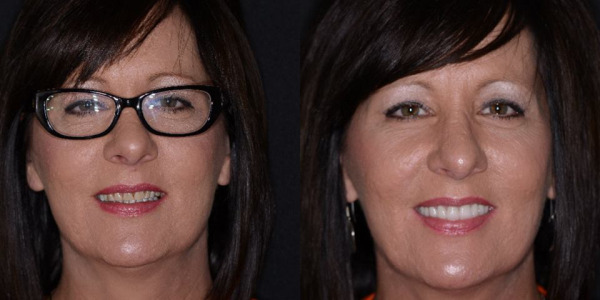 Through digital imaging, we can simulate what veneers would look like for you. Because we use the finest of porcelain materials for our veneers, we are able to offer a limited 5-year warranty on the dental work, giving you peace of mind that your veneers will last. To learn more about porcelain veneers, contact our office to schedule a consultation appointment. Dr. Pybus is happy to provide you with a no-fee consultation for your veneers.